South Africa has seven biomes. (A biome is an area that has specific characteristics and is covered by a broad vegetation type.) Two of these biomes, forest and fynbos, are found in the Westford Bridge Private Nature Reserve. The Reserve also contains an area of estuarine wetland. The Fynbos Biome, also known as sclerophyllous shrubland, covers only 6% of South Africa, in an area confined to the south and south-west coast. Despite this small area, it has over 33% of all the plant species in the country and is world-famous for its diversity and abundance of wild flowers. Fynbos is characterised by woody shrubs and perennials, together with some bulbs and corms. There are usually three layers of fynbos: medium shrubs up to 3m in height, a middle layer of grasses, smaller shrubs and restios, and an undergrowth of herbaceous perennials. Periodic fires are essential to rejuvenate the fynbos. The Forest Biome covers less than 0.4% of South Africa's surface, mainly in isolated patches along the southern and eastern coast-lines. It consists mostly of evergreen trees with underlayers of smaller trees and shrubs. Westford Bridge Private Nature Reserve is fortunate to have a small area of forest in which over 80 species of trees have been identified and labelled. The wetland area, while not classified as a biome, is vitally important to the ecology of the whole estuary. The Knysna estuary is the largest on the South coast and contains the highest plant and animal diversity of all South African estuaries. Twenty-seven species of saltmarsh or estuarine plants have been found, as well as various reeds and rushes. 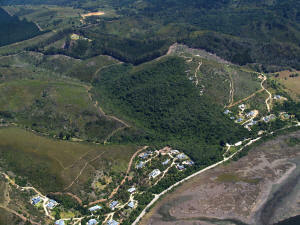 Aerial views of the Reserve, clearly showing the fynbos biome above the houses, the forest biome in the centre and the wetlands next to the estuary.